Pine Lakes Country Club, nicknamed “The Granddaddy”, is the oldest Myrtle Beach golf course, dating back to 1927. This wonderful golf course is steeped in history and Southern traditions. Pine Lakes was designed by Robert White, who was the first president of the Professional Golfers’ Association of America. White laid out a beauty by using the natural terrain and sand dunes left over centuries by Mother Nature. The back nine is still White’s original layout while the front nine was recently renovated. All of the recent renovations, including the clubhouse, were done with the intent of preserving the traditions and spirit of the 1920’s. Pine Lakes is an enjoyable golf course for all skill levels of golfers as the lush fairways wind through the natural dunes and freshwater lakes. The Grand Strand is home to almost 100 Myrtle Beach golf courses and it all started with Pine Lakes Country Club. You will certainly enjoy the historical values of Pine Lakes. When visiting the Grand Strand, give serious consideration of including Pine Lakes in your golf itinerary. Pine Lakes has a new entrance. Before the renovations you entered Pine Lakes from Hwy. 17, but now the entrance is on Robert Grissom Parkway. The convenient location gives easy access to Broadway at the Beach and all of its outstanding Myrtle Beach entertainment. Book your Myrtle Beach golf package today! We started our golf trip at Pine Lakes CC and what a start it was. Everything about the place exudes class and the staff are extremely nice and really show their appreciation of your business. The course was in excellent condition with the greens (although a tad slow) in excellent condition. We enjoyed the pace of play and never felt rushed at any stage. 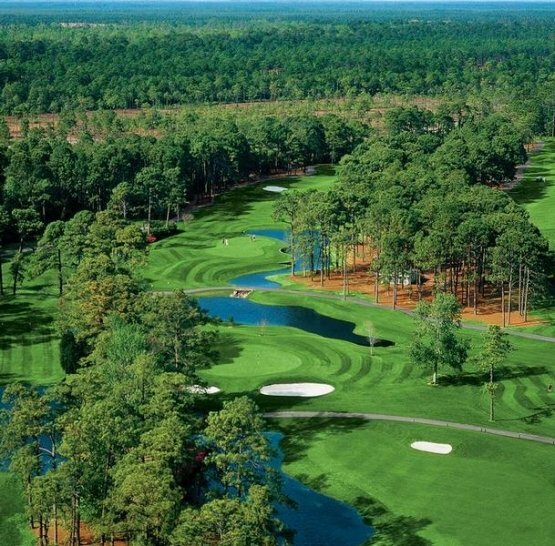 If you are looking for an introduction to Myrtle Beach golf then Pine Lakes is it. Loved the short grass on the fairways on this course. Great day all in all. I would caution the cart guys to slow down a bit when the come out of the cart storage area. The visibility isn't great and I had to slam the brakes on my cart but still rear ended our friends in front of us. No harm done and we had a good giggle but just thought you should know. Very good, good variety, better turf than most.